Note: Contrary to suggestions on some bulletin boards, the images here are not photoshop. With the exception of those labelled as artist's impressions these are photos of medical conditions. These pages are intended as a medical reference site. Offsite links to images on these pages is not supported - bandwidth costs money! 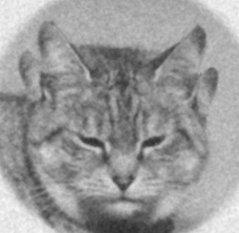 The earliest report I can find of a four-eared cat is in "Cat Gossip," 15th May, 1929: " 'Unsere Katze' relates that a voting Russian tramp is always accustomed to take a blue tom cat with him on his wanderings. He found it as a half-starved kitten in the ruins of Moscow; short of food himself, he managed to rear the kitten, which now provides for him, entering houses through the window and stealing provisions, which it shares with its human friend. This cat has four ears; a cat belonging to a Viennese publican had four ears and two tails, this ‘freak’ was sold for 600 dollars to America." 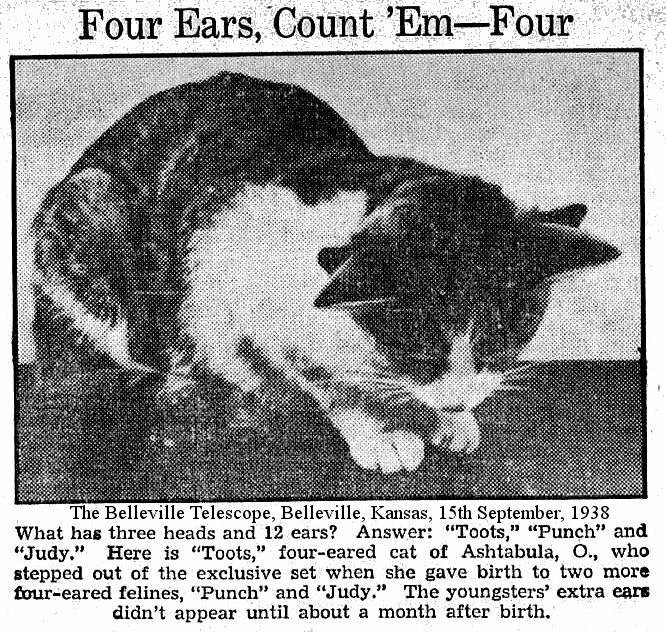 The press release sent to those, and many other, papers gave a bit more detail about Toots, whose supernumerary ears appeared to be genetic and heritable. "Ashtabula, Ohio - Toots is no longer the only four-eared cat in the world but she gained the distinction with losing her title. Toots you see, had kittens 'Punch' and 'Judy' each have two extra fuzzy tips alongside the regular ears. The youngsters extra ear sets appeared about a month after their birth, but the feather-like growths haven't sprouted enough yet to be picture-able. As the only four-eared feline, 'Toots' was spared from the stuffing room of the National Museum in Washington last month when Mrs George Wood, her owner, declined a $100 offer for the pet." Not all Four Eared cats die before birth, so perhaps it is another gene with variable expression. 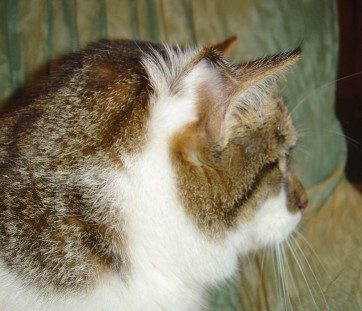 A four-eared cat was exhibited at a British cat show in the late 1990s and apart from the smaller, extra ears it was apparently quite normal. As with many physically similar traits, there may be several different genetic mutations. The Chattanooga and 1957 cats may have had a different deformity to more recently reported four-eared cats which are otherwise normal. Alternatively, there may be a single mutation with variable expression - different degrees of deformity ranging from cosmetic through to damaging. In humans, there have been cases where extra auricles (earlobes) were present below the normal ear but did not have an ear canal. reported forms are: additional "lobes" to ear flaps, additional ears not connected to normal ear flaps. The exact placement/alignment of the additional ears may also differ. A secondary set of smaller ear flaps (pinnae) is set behind functional ears. and not connected; there may be rudimentary middle ear structure (artist impression). Secondary smaller flaps set to outside of main ear flaps. Usually the main ear flaps and secondary ear flaps are connected and in some cases are simply lobes of the main ear flap. Pinnae are lobed; extra ear flaps at right-angles (in some cases back-to-back) with normal ears, do not appear to be mobile independently of main ear flaps. Normal middle and inner ear structure associated with main ear flaps and not duplicated (extra ears sometimes have "blind" openings). The cat is reportedly physically and mentally normal and the extra pinnae could be cosmetically removed. Ewa Enderleit in Denmark has a 4-eared cat called Joey. The vet believes this to be due to the mother, 2 year old Scottie, being given hormone tablets as no-one was aware she was pregnant until her single female kitten, Joey, was born on the night between September 1st and September 2nd 2003. A mummified foetus was later removed during spaying. 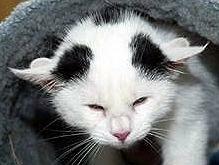 In March 2004, a six-month old cat with four ears was put up for adoption at an animal shelter in Murnau, southern Germany. Lilly was born on a farm in Bavaria and has an extra pair of slightly smaller ear-flaps behind her normal ears. This unusual trait is a rare gene mutation; the extra ears do not have any hearing ability. The front ears are completely normal. None of Lilly's littermates were affected. Many farm cats in the area are not neutered. Lilly has since been adopted by a family who already had cats from the same shelter and who did not intend to exhibit her as an oddity. In March 2004, the Russian news agency Pravda reported an unusual kitten born to two ordinary domestic cats in the Samara Region. The kitten had seven ears instead of two. 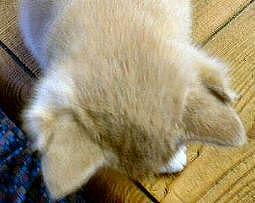 At first, the owners noticed the kitten had three ears: two normal ears and a third one inside one of the normal ears. The kitten was named "Three". 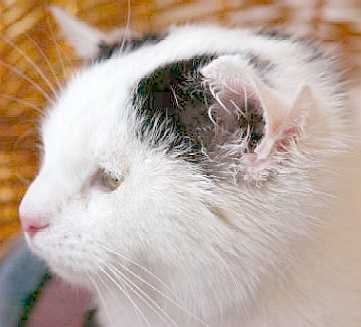 Several months later the owners discovered additional ears when they bathed the cat. The supernumery ears were normal in appearance apart from being very small and poorly developed. The cat had two small ears inside a big one and two ears on its cheek. The seven ears give the cat no problems - in fact it seems unaware of them. It is claimed to have especially good hearing, but mostly when called for meals! In October 2004 I received an update from Adam: "Her name....Bug-a-Lugs. Seems to fit not just her physical characteristics, but spot on for her personality too. She is still extremely lively and intelligent, always watching what's going on and talking, insisting on being taken for walks, chasing her tail and bouncing off walls. I would suggest that she is actually abnormally intelligent, which would support the belief that the affected allele has an effect on the brain (albeit in a positive sense in her case). Her pupils are almost always fully dilated, giving her a staring look. They do, however, respond to bright light. I guess that this could be due to either an abnormality in the eye or the brain. She has grown but, I suspect, will always be a fairly small cat. When she runs down stairs, with her 4 ears horizontal from her tiny head, I swear she looks like she could get airborne. Could this be the next stage in feline evolution, catching birds on the wing?" Adam also mentioned another 4-eared kitten which indicates a genetic, rather than a developmental, trait: "And one last piece of news. She now has a rival, another 4-eared cat has been born to the same mother! 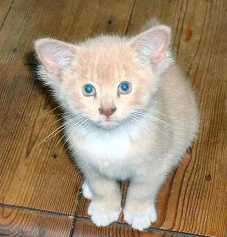 This kitten has now gone to a home in Brackley." Lauren Cottrell provided me with an update on Bug-a-lugs in March 2006: “She is now affectionately known as Freaky and not only does she have four ears she has also been diagnosed with dwarfism. She now lives on the south coast near Chichester where I have moved to. I have been told by the vet that she probably will not live for long but she doesn’t seem affected by her size at all. She loves to be out and about but before she was let out for the first time she was spayed. If she had got pregnant being the size she is, it would have done her considerable harm. she loves to come out for walks with the dogs on her lead and loves swimming in the sea. She has a little life jacket made for small Chihuahuas as she is not quite as good at swimming as she likes to think. She is not as quick as the other cats but still manages the bring home small birds and mice, she seems very proud of her self and loves leaving them in the bedroom for me. She is a very affectionate cat and gives great cuddles. She doesn’t seem to have any brain abnormalities though she does seem to have taken a lot longer to grow up mentally.” Sadly Freaky was killed by a Staffordshire Bull Terrier in April 2006. Being so small, she was unable to jump over a fence to safety. 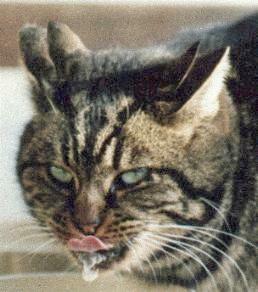 This 4 eared cat is tabby-and-white Gizmo from Lafayette, USA whose story was released on October 19, 2004. He was a barn cat, probably descended from dumped cats, and was rescued by the Bowen family. His intriguing deformity is probably due to extensive inbreeding according to Dr. Sharon Ellman-Murray, DVM. Gizmo has been adopted as NCISN poster kitty promoting responsible spay and neuter to prevent overpopulation. Although Gizmo's deformity is endearing and not harmful, inbreeding can lead to more serious problems. Gizmo's photo and information were kindly provided by Dr Sharon Ellman-Murray. Unlike the other 4-eared cats shown here, Gizmo's extra ear flaps appear to be inside his normal ears and facing in the opposite direction. The additional ears do not have ear canals associated with them. Following a veterinary exam, Gizmo was reported to be completely normal in all other respects and has a normal sister. He is active with no sign of mental retardation. 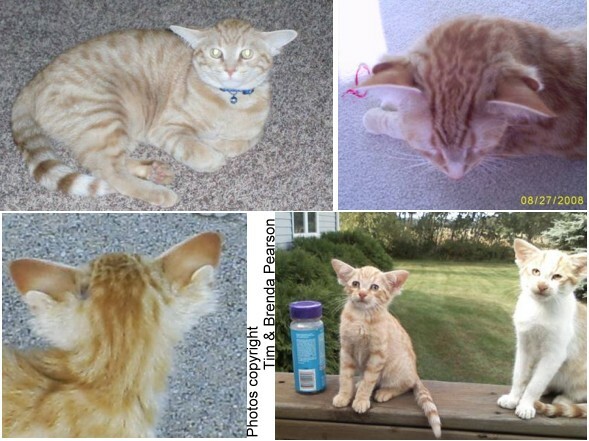 Yoda and his brother were born on Brenda Pearson's parents' farm in Capron Illinois in May 2007, and out of a litter of 4, both male kittens had four ears. This indicates a genetic trait, probably similar to Bug-a-Lugs/Freaky mentioned earlier (the facial shape is also similar). Yoda now lives in Belvidere, Illinois with Tim and Brenda Pearson. The Pearsons' vet found a home for his brother Ted who is apparently a successful exhibition cat. Sadly their mother and female littermates were killed by another animal and Yoda had teeth-marks and ripped skin from the attack and also a ball-bearing in his jaw from being shot at. His extra ears are only visible from the side and back of his head. Yoda's personality is extremely outgoing, loving, playful and well-mannered (he comes when he's called by name, he's never aggressive, always uses his litter box, and has learned to stay off the tables and countertops). He also appears to have above normal intelligence. Yoda is a popular name for cats with 4 ears. This Yoda (previously named Barfly) belongs to Valerie and Ted Rock. They were in a Chicago bar in 2006 and saw a grey kitten being passed around curious fellow drinkers. They adopted the 8 week old kitten from his owner and named him Yoda. Their vet was mystified by his unique appearance and found information on the web. The extra ear-flaps (non-functional) are situated behind the normal (functional)ear-flaps and are not attached to the base of the skull, nor do they appear to have ear canals. The skull is broader than normal, giving him a triangular face. Yoda has normal hearing and behaviour and the presence of the extra flaps appears to be cosmetic. 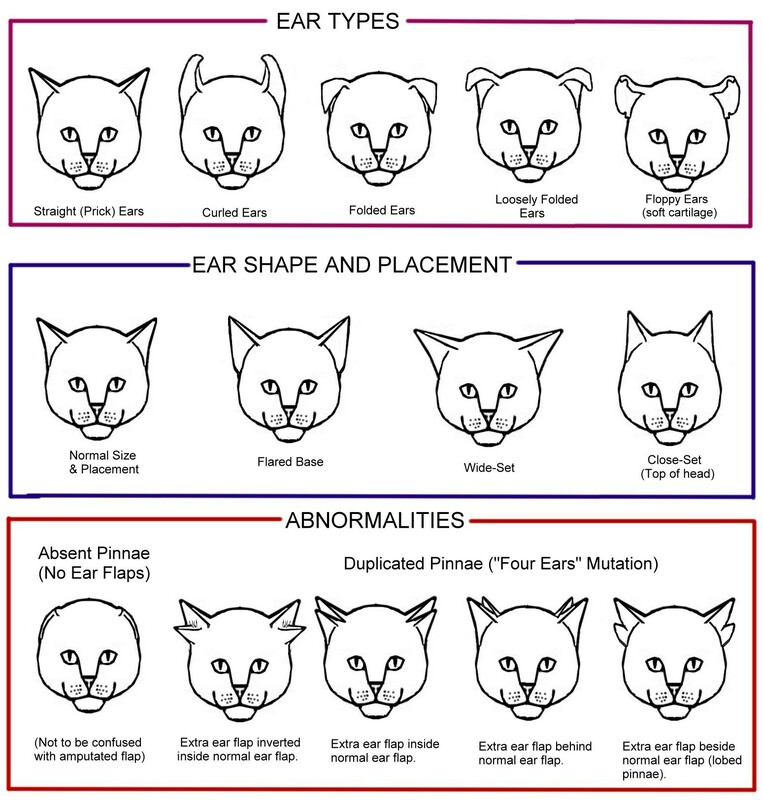 Interestingly, the functional ears have rounded tops which is unusual for a domestic cat, while the non-functional ears have a more normal pointed appearance. In August 2011, news agencies reported a four-eared Russian kitten called Luntik that lives at a service station in Vladivostok. The supernumerary ears are not functional and are just ear-flaps. Some papers have nicknamed Luntik the "Jedi cat". 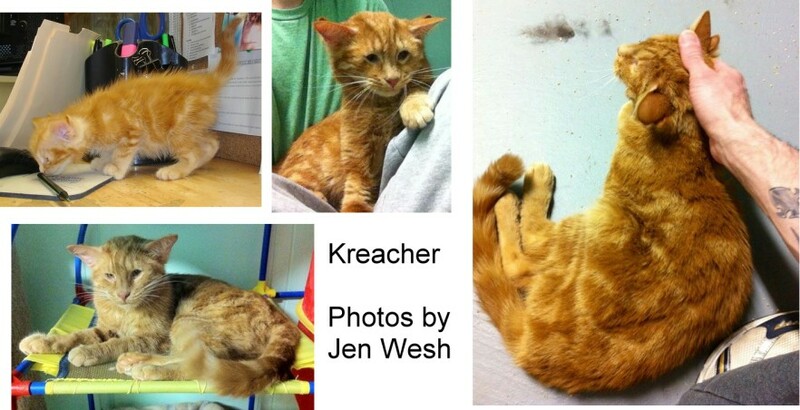 Jen Wesh (2013) of Joa's Arc Rescue, Audubon, New Jersey has a four-eared cat named Kreacher. Kreacher, who has his own Facebook page “Kreacher the 4 Earred and Fabulous Cat”, was born in southern New Jersey, USA, in the Spring of 2011. He was taken into the animal shelter at around 6 weeks old with his two completely normal siblings. Kreacher's extra ears are not functioning ears and are connected to an ear canal. His normal ears are rather large and his ear canals are long and thin and need regular cleaning. In addition to additional ear flaps, he has some other issues including juvenile cataracts, some facial deformities and paralysis, and he's very petite for an adult cat. This indicates that there are several causes of 4 ears in cats, with different side-effects. Kreacher's facial appearance and the conformation of his ears is similar to that of ginger Yoda. 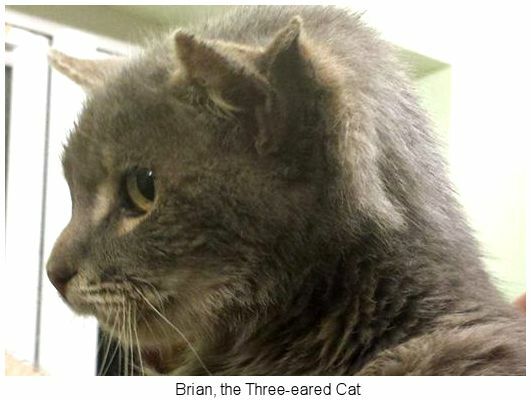 A three-eared cat was found in Norfolk, England in November 2015. He had strayed or been abandoned near a garage and was taken in by Feline Care Cat Rescue, in East Harling, Norfolk who named him Brian and is thought to be between four and eight years old. He almost ended up with a Star trek themed name because he has a left ear, a right ear and a “final front-ear”. Another 4-eared feline was reported in August 2016. A 3 year old black cat named Batman became an internet star after the four-eared feline was found at the Western Pennsylvania Humane Society shelter. Batman’s second set of ears is said to be the result of a recessive genetic mutation. 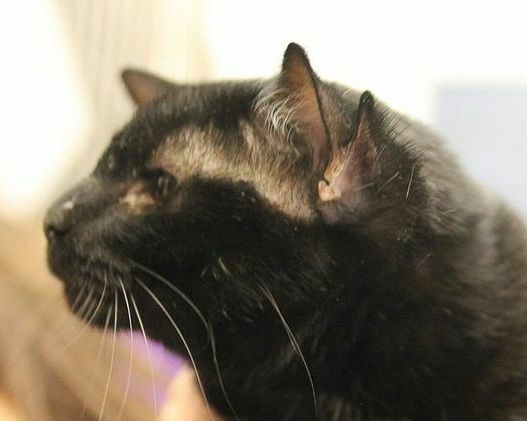 The condition has been documented since at least 1936, when a four-eared cat named Toots was found in Ashtabula, Ohio, according to the Western Pennsylvania Humane Society. Just hours after that news was announced, he was adopted by a family with a young daughter. In addition to multiple ear-flaps, some cats have been born with no external ear structures. This has been seen in a Persian cat and may have been associated with inbreeding for the modern ultra-type. The cat's middle and inner ears were intact and it was not deaf. Lack of outer ear affects a cat's ability to pinpoint sound - something cats do by swivelling their ear-flaps much like radar detector dishes. Many of the ear-less cats around are due to removal of the ear-flap because of skin cancer caused by over-exposure to strong sunlight (especially in pale coloured cats as these lack protective pigment). In January 2008, Myndi D, who works at a vet clinic and also fosters rescue cats provided these photos of a longhaired cat born without ear pinnae. 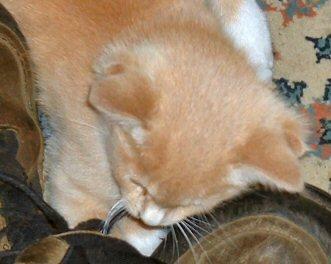 The kitten was found by her neighbour in Lehi, Utah. She is about 4-5 months old (when photographed) and named Emma. Myndi's first thought was that the ears had been cut off, but there is no scarring. Emma has no other abnormalities and can hear well. 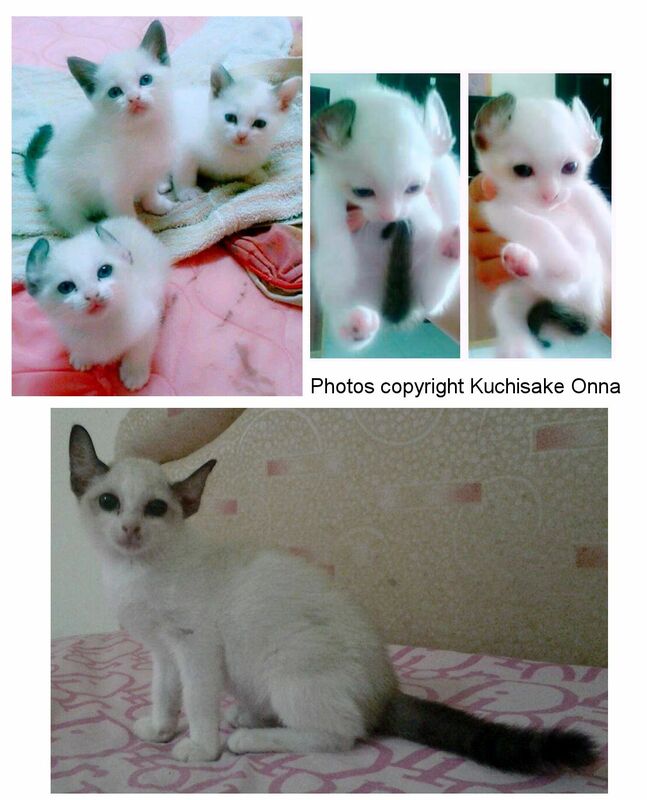 Kuchisake Onna from Brunei Darussalam provided these photos of an unusual curl-eared kitten adopted in 2016. The skull shape is also a bit unusual and might indicate a chromosome abnormality. The parents are both domestic shorthairs with normal ears. None of the littermates have the curled ear shape. And these photos from Jelena Nekrasova also show an unusual ear shape. Two mutant ear forms have been fixed as breed traits. One is the Scottish Fold, where the ears are folded forwards. The other is the American Curl where the ears are curved backwards as though windswept. 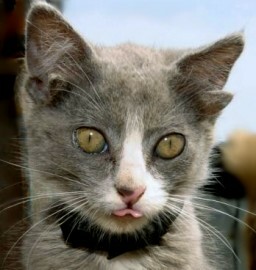 A "lop-eared" variety of cat (the Sumxu) once existed in China, but is now extinct. 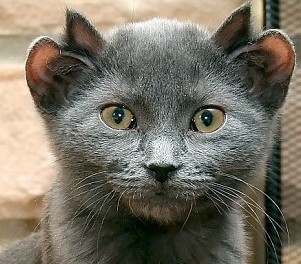 Fold-eared cats have occurred spontaneously in Essex, England and The Hebrides, Scotland. 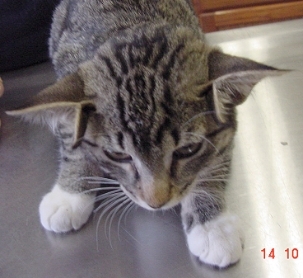 A curl-eared cat occurred in Australia. These are detailed at Curled, Curved and Folded Ear Cats . The type of cat known in China in antiquity as "four-eared cats" were not four-eared at all; the name derived from the long ear furnishings of long-haired cats which gave them the appearance of having extra ears inside their normal ones.